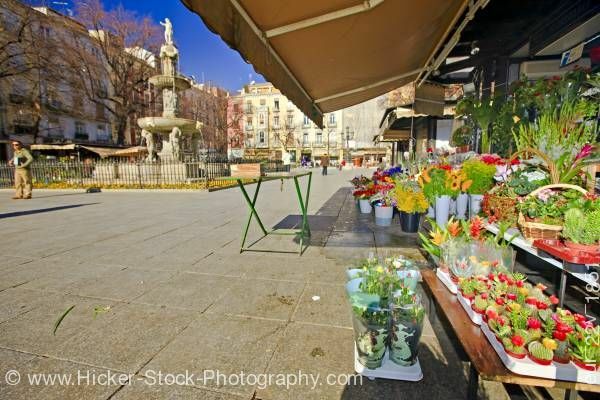 Stock photo of the flower market stalls in Plaza Bib-Rambla, City of Granada, Province of Granada, Andalusia (Andalucia), Spain, Europe. Colorful flowers in a market stall of the Plaza Bib-Rambla in the city of Granada. This stock photo shows the flower market stalls full with brightly colored flowers in Plaza Bib-Rambla, City of Granada, Province of Granada, Andalusia, Spain, Europe. Fresh cut flowers in containers and plant baskets of varying bright colors and sizes sit at the market stall in the Plaza Bib-Rambla. Even cactus with bright red or yellow blooms sit on a low shelf of the market stall. A large brown canopy covers the stall to add shade for bright sunny days along the market. A beautiful sunny day has a few people walking along the stone walkway of the plaza to shop at the market stalls. A large water fountain sits in the center of the plaza with a wrought iron fence around it. In the background of the water fountain, additional market stalls stand in front of the tall buildings of the Plaza Bib-Rambla. Flower market stalls in Plaza Bib-Rambla, City of Granada, Province of Granada, Andalusia (Andalucia), Spain, Europe.